League of Legends doesn’t need to be all grimdark, all the time. There’s more to life than slugging it out on the Rift; putting champions in less-than-serious situations is one of the things that makes League so uniquely… League. Where would we be without Pool Party Graves, Sinful Succulence Morgana, or AstroNautilus? We knew that we wanted to keep this sense of fun front and center with this year’s Snowdown. And since nothing is more fun than a snow day, artists and visual designers started with one simple question: What happens when League’s champs take a day off to engage in a little snow-to-snow combat? “When I was a kid, I was all about snowball fights,” says visual designer Kelly Aleshire. “Snow days were awesome. There’s a sense of, ‘I was supposed to do something today, but now I get to have fun instead. '” Communicating that feeling to players was key goal for the teams working on Snowdown. 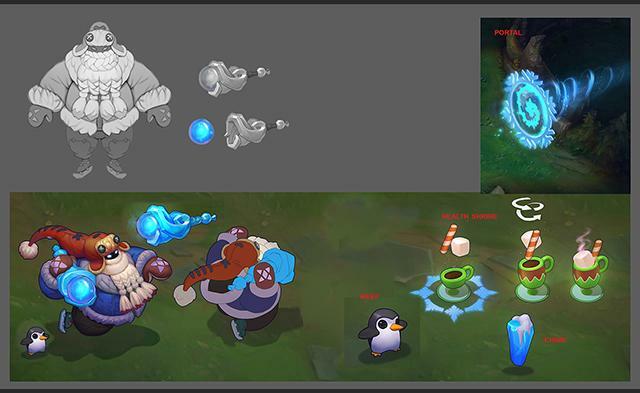 Whether through Syndra’s oversized earmuffs, Bard’s penguin-ified meeps, or the somewhat-goofy snowplow super minions, the main focus was on making things feel uniquely fun. Concept artist Wesley Keil explains, “It’s one of those light-hearted, zany things where you can step away from the serious stuff.” With this year’s Snowdown, “the team wanted to create something really playful,” emphasises Aleshire, “so the feedback was mostly centered on hitting that ideal without going too over-the-top.” Each concept went through several iterations as artists worked to find something that felt right for the overall theme but still fit the champion. Gnar might wear a winter cap, for example, but he still needs to feel like Gnar. This year’s Snowdown was made more complicated by the inclusion of Snowdown minions. While minions are less complex than champions, their simplicity brings its own flavor of difficulty. Says Keil, “They have to read clearly; there are a lot of gameplay ramifications -- what happens when there are a ton of them on screen, etc.” Just as the team needed to balance the skins between the Snowdown theme and the core personality of each champion, the minions needed to be clearly Snowdown without hampering actual gameplay. Fun’s no fun if it creates confusion in the game, after all. 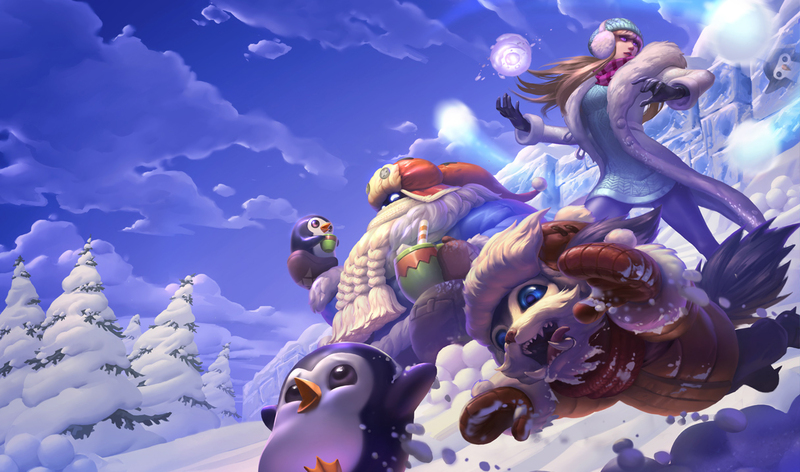 Finally, the splash is perhaps the most clear distillation of Snowdown as an idea, showing off the skins while capturing the personality of each champion and communicating the overall theme of fun in the snow. “Bard, for example, is kind of aloof,” says Aleshire. “He’s not super worried about humans or the universe as we see it, so he’s just in his own little world sharing some cocoa with a Meep. Gnar has a hyperactive attitude, so he’s distracted and chasing a Meep instead of helping.” Syndra, a more focused champion, is ready to start the next volley and/or claim victory. The splash bears the responsibility of bringing everything together in one image that tells the whole story. We have this moment every now and then, where a bunch of serious characters take a day off and play in the snow.